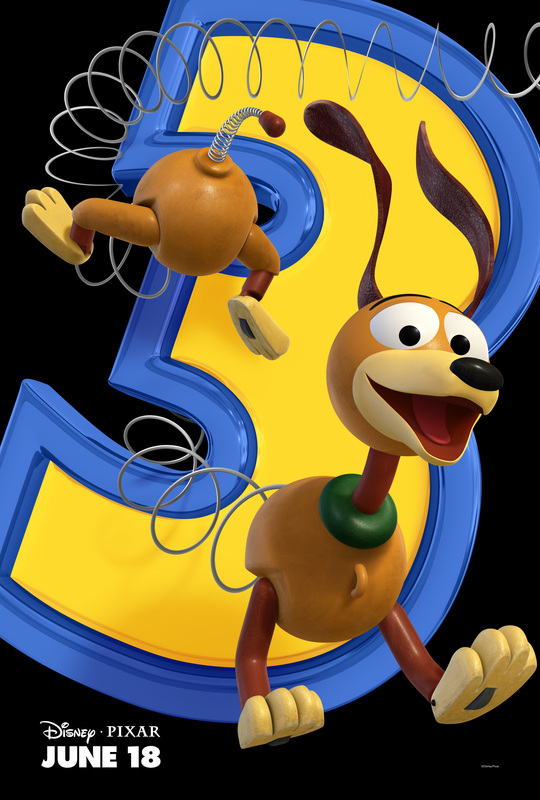 The TOY STORY 3 - SLINKY Poster Exclusive is here!!! Hey folks, Harry here with our exclusive TOY STORY 3 character poster. Disney sent these out to pretty much all of the online entertainment web folks with the idea of promoting tomorrow's big online launch of the Glorious Quicktime HD Tootsie Pop of a Trailer for TOY STORY 3 which is the first look at the actual film and not just something they whipped up promotionally separate from the film. But frankly, the best way to see this trailer is attached to TOY STORY 1 & 2 in 3D... which is in theaters right now. I saw this double bill at FANTASTIC FEST, where we were lucky enough to have an early debut of this very special treatment. Now - like most of you people with a soul that loves toys, sunsets and fields of flowers... we love TOY STORY 1 & 2. But Pixar's process of rerendering the original 2 films in 3D... it was stunning. It made me completely rediscover the film. Intellectually I knew the story, the twists and the beat - but the 3D made me forget all of that and be rewowed by the films. You really do owe it to yourself to check them out theatrically - as they're not out there much longer. If they haven't left already. This all brings me to the joy of talking about SLINKY here. My childhood dog was a weenie dog that I named Dr Demento. Yes, I was a fan of a certain radio show as a very small kid. Slinky has always reminded me of Dr. But click on the poster below and you'll see the original giant file where you can zoom in and see the incredible level of detail that Pixar has layered onto Slinky - the subtle wear and tear that would be upon a toy that has survived a rambunctious Andy. The scrapes and scruffs, the dirt and slight bit of damage. Its evident he was loved and played with. Can't wait to see this whole movie!